Dunster Beach is surrounded by great coastal and countryside walks. The site is situated on the Steam Coast Trail and West Somerset Coast Path which joins the South West Coast Path at Minehead. Extened in 2016, it now runs for nearly 60 miles from Brean Down to Minehead. It forms part of the England Coast Path which is expected to be completed in 2020 when it will become one of the longest walking routes in the world. Created by H.M. Coastguards for patrolling the South West coastline on the lookout for smugglers it gives us the stunning path we can use today. The path was also used by fishermen looking for shoals of fish and for checking the sea conditions. The path itself is 630 miles long and is the longest national trail in the United Kingdom. Starting just a short walk along the coast from Salad Days & Holi Moli Beach Huts at Minehead it runs along the coastline of Exmoor, continuing along the coast of North Devon and on into Cornwall. It follows across the mouth of the River Tamar and back into Devon. After running along the south coast of Devon it then follows the Dorset coastline before ending up at Poole Harbour. It is a great place to take your dog walking. 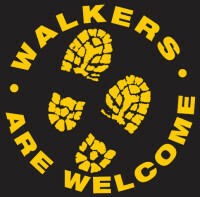 Dogs are permitted on the entire length of the path and providing that you look after them in a responsible way avoiding livestock and wildlife or causing a nuisance to other walkers, you will be welcomed all along the Path. Click on the interactive map below to go to the South West Coast Path Distance Calculator to help you plan your walk before your stay. 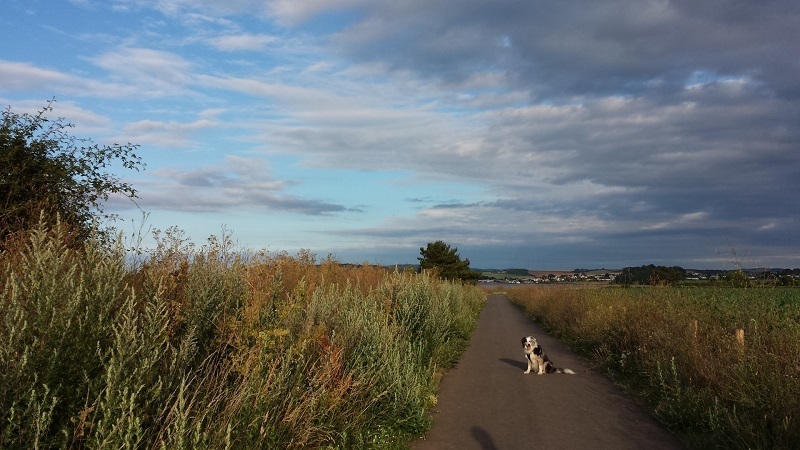 The South West Coast Path distance calculator is a tool designed to help you plan your walks. Drag the markers to set your walks start and finish points. Zoom in to select your locations more accurately. 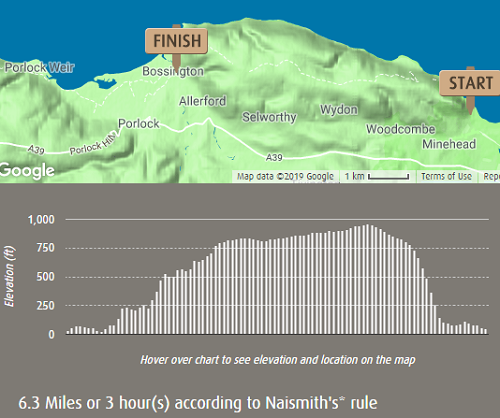 The tool shows elevations of the area you will be walking. 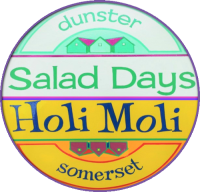 On arrival at Salad Days and Holi Moli you will find a collection of useful information including Ordnance Survey maps, local walking guides, pocket guides, tourist information, attraction leaflets as well as the 'Fun Stuff' folder with loads more of our recommendations. 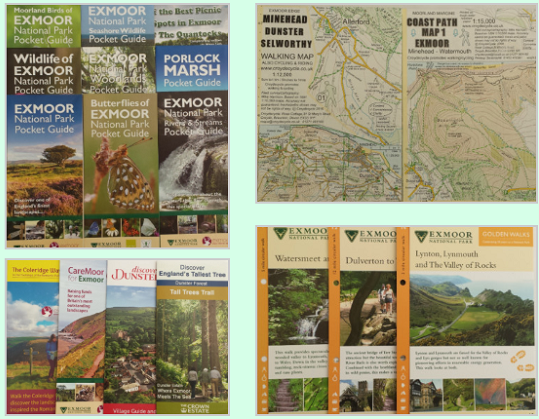 Laminated sheets with local walks can be found in the folders, ideal if you have a dog or simply do not want to take the car. This is a new and expanding database of walks in the UK and around the world. Phototrails helps everyone discover and enjoy access to the countryside, tailored to their own needs, preferences and abilities. Phototrails understands the importance of providing pre-visit information on walk features and site amenities, such as whether disabled parking and accessible toilets are available. Each walk is described through a series of photographs which let you see just what the walk is like. They include information on the surrounding environment, the walk distance and the features and highlights that you will find along the way. Each walk is given an accessibility rating to help you decide whether a walk meets your needs. 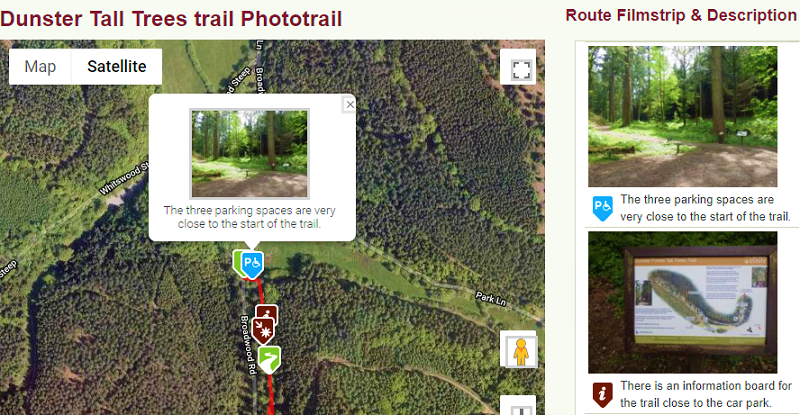 Take a look at an example of a local Grade 1 Phototrail in Dunster Forest. The Dunster Tall Trees Trail which passes the tallest tree in England. ​​Grade 1: These walks have no barriers or steep gradients. Grade 2: One or two features may reduce the accessibility of these walks. Grade 3: Several features on these walks may more frequently reduce their accessibility for some people. Grade 4: On these walks there are lots of features that reduce their accessibility. Grade 5: These walks have many features which reduce accessibility such as stiles and steps. This path will eventually run from Minehead to Williton via Dunster Beach. The trail already links Dunster Beach with Blue Anchor Bay (except the last 100 metres), making an accessible walk to Driftwood Cafe even easier. The trail is also cycle friendly, so why not bring your bike away with you, there are bike racks at Salad Days and Holi Moli.